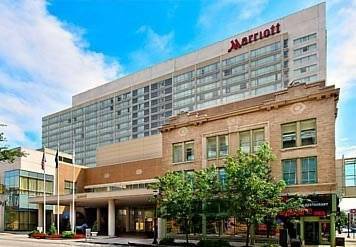 Discover the dynamic environment at Louisville Marriott Downtown, conveniently attached to Kentucky International Convention Center. Our hotel offers spacious rooms with modern amenities near Louisville International Airport. Reserve one of our suites for separate living and sleeping areas, or stay on the concierge level for access to a private lounge area with complimentary continental breakfast and Wi-Fi. Stay productive in the privacy of your own room using our well-lit desks and ergonomic chairs, or visit our full-service business center for additional services. Enjoy a savory meal at one of our on-site dining venues including BLU Italian Grille and our sports-themed Champions. Host a conference or celebratory banquet in one of our 20 event spaces. Our culinary team and expert planners are available to plan every detail of your grand event. Whether you're catching a game at Prudential Center or listening to music at 4th Street Live, explore the area in style when staying at Louisville Marriott Downtown. Enjoy one of the finest Italian restaurants in Louisville when staying at our hotel. Discover our extensive wine list, private dining room and classic Italian cuisine with a contemporary flare. Visit our high-energy sports-themed bar and restaurant in Louisville for a fun environment complemented by friendly staff. Our menu features great bar fare and casual food, including delicious burgers, ribs and quesadillas. Stop by our popular coffee house to enjoy the full Starbucks menu with specialty drinks and fresh pastries.